Candidates for admission to the Two-Year MSW Full-Time Program require an appropriate bachelor’s degree from a recognized university, and shall have achieved at least a mid-B or better in the final year of full-time study or equivalent, in senior level courses (300 or 400 level. In addition, we require three full-credit courses in the social sciences, to include a half-credit course in elementary research methodology. Note: According to the School of Graduate Studies Calendar, “an appropriate bachelor’s degree that has appropriate breadth, depth and, where appropriate, an affinity to the graduate program to which the applicant is seeking admission as determined by the School of Graduate Studies”. Candidates for admission to the MSW Program with Advanced Standing require a Bachelor of Social Work degree from a recognized university, and shall have achieved at least a mid-B or better in the final year of full-time study (or equivalent). For admission consideration to the PhD Program candidates must normally have a Master of Social Work degree or an equivalent Master’s degree with a B+ average from an accredited program in a university of recognized standing. Applicants educated at non-Canadian institutions should note that their educational background will be assessed for equivalency with a University of Toronto degree as described above. Please visit this web page and select a country from the list to determine which international credentials are required for masters and doctoral admissions at the University of Toronto. Complete a make-up program consisting of four full university courses or equivalent at the senior-level (third or fourth year), and attain a B+ standing. As part of the make-up program, we recommend that you take a half-credit course in elementary research methodology (this course can be completed at the 200 level). Upon completion of the make-up program, and provided you have received the B+ average, you can apply to the two year MSW Program. Complete the Bachelor of Social Work (BSW) degree, and attain a mid-B standing. As part of the BSW program, we recommend that you take a half-credit course in elementary research methodology. Upon completion of the BSW degree program, and provided you have received the mid-B standing, you can apply to the MSW program with Advanced Standing. 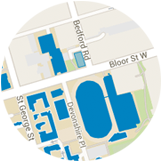 The BSW is not available at the University of Toronto. In the Toronto area it is available at both York University and Ryerson University. For a complete list of accredited social work programs in Canada please visit the Canadian Association of Social Work Education web site. Please Note: Completion of the above does not guarantee admission. For more information contact the Factor-Inwentash Faculty of Social Work, Admissions Office by email: admissions.fsw@utoronto.ca.